The change in the physical behavior of gases at elevated pressures and in the hyperbaric environment itself exposes the human body to various stressors. This article—which will be presented in two parts—discusses inert gas narcosis (ING) and how it affects the diver, the mechanism behind narcosis, and methods used in order to ameliorate the negative impact of narcosis on divers. In a mixture of gases, Dalton’s law of partial pressures explains the relation between the total pressure exerted and the partial pressures of the individual gases. As the absolute pressure increases, the partial pressures of nitrogen and oxygen—in a mixture of air—will also increase. As the partial pressure of nitrogen rises in the body, so does the amount of nitrogen in our blood and tissues. This is due to Henry’s law, which states that at a constant temperature, the amount of gas dissolved in a given type and volume of liquid is directly proportional to the partial pressure of that gas in equilibrium with that liquid. ”The functions of the brain are activated, imagination is lively, thoughts have a peculiar charm and, in some persons, symptoms of intoxication are present.” This is how in 1835 Junod described the effects of breathing compressed air in a hyperbaric environment . In 1878, Paul Bert, in his monumental "La Pression Barométrique", noted narcotic properties of air when breathed at increased pressures . It was not until 1935 that Behnke, Thomson and Motley explained the phenomenon and discovered that the narcotic potency of nitrogen was the cause of the intoxicating effects in diving . To avoid this problem, in deep diving, nitrogen is commonly substituted by helium. Behnke pioneered the use of non-nitrogen gas mixtures, by using heliox (helium-oxygen) diving schedules during the rescue salvage operation of the USS Squalus in 1936 from a depth of 74 meters. However, helium allows the expression of High Pressure Nervous Syndrome (HPNS). Another gas that has been extensively under research for use as an alternative breathing gas in diving is hydrogen. Arne Zetterström of the Swedish Royal Navy first introduced the use of hydrogen as a diving gas in 1943. Hydrogen has been considered and used in very deep diving as it comes with some advantages over helium , . However, its use includes some disadvantages that we will see later. Nitrogen. Behnke and his colleagues noted that air at high barometric pressures produces a narcotic effect on humans. This state of abnormal functioning usually first appeared at three atmospheres absolute pressure (20 msw) and consisted of altered behavior, delayed mental activity and impaired neuromuscular coordination. Although nitrogen is chemically inert, its physical properties make it analogous to narcotic substances. The principal reason is its high solubility in lipoid matter . The onset of symptoms of nitrogen narcosis varies from diver to diver. Mild signs and symptoms can appear at 30m, but some individuals might be susceptible at shallower depths. It has been shown by psychometric tests that there is a wide individual variability and dive-to-dive or day-to-day variability. This is due to different individual physiological susceptibility, and to some other predisposing factors, such as fatigue, cold, increased partial pressures of carbon dioxide because of hard physical work, alcohol use or ”hangover” conditions, work of breathing, anxiety and apprehension, as well as a rapid compression rate . Behnke et al. stated that nitrogen narcosis is not sufficient to be a problem at 30m, but the situation tends to be worse at deeper depths. Symptoms tend to develop in a subtle way, but with harmful effects, if ignored by the divers. Initially, there is light-headedness, euphoria, impaired judgement, and a false sense of security or overconfidence. 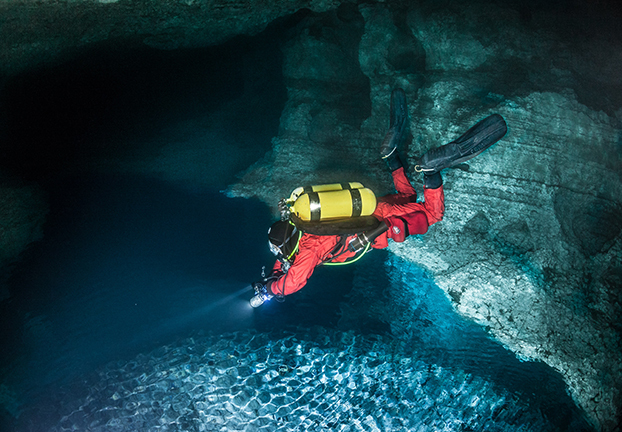 If the descent is not halted, the diver may suffer from impaired concentration and memory, peripheral numbness, or hallucinations. The final stage of nitrogen narcosis (ca. 100 msw) is more severe, and includes lethargy, drowsiness, and ultimately loss of consciousness. At these depths, however, when breathing air, the toxicity caused by the high partial pressure of oxygen would likely cause injury to the diver. Everybody is affected at some depth, but there is the tendency to deny its occurrence—similar to alcohol and driving. There is no doubt that each diver copes, or learns to cope, differently with narcosis. Highly trained and experienced divers gradually accommodate the narcotic effects of narcosis. They learn to tolerate more effectively the different stressors during deep dives and recognize their own signs and symptoms. As mentioned above, individual physiological variability, as in alcohol, plays an important role , . Usually, ascent at shallow depth will resolve the effects of nitrogen narcosis, reducing the symptoms of intoxication. However, a recent study by Balestra et al. showed that narcosis did not subside immediately after ascending to shallower depths, but its signs and symptoms remained even after the divers had surfaced . Helium. According to their lipid solubility, three other gases are expected to be less narcotic than nitrogen: hydrogen, which is two to three times less narcotic than nitrogen; neon, which is at least three times less narcotic than nitrogen; and helium, which is four to five times less narcotic than nitrogen (Table 1). Theoretically, based on the lipid solubility, the narcotic effect of helium should occur at around 400m below water . However, the high environmental pressure at this depth counteracts the weak narcotic potency of helium due to the pressure reversal effect. Johnson and Flagler, while experimenting on amphibians, observed the “pressure reversal effect” in 1950. They anesthetized tadpoles using ethanol (alcohol) and other drugs. The narcotized animals were later exposed to very high hydrostatic pressure in a steel chamber. Pressures up to 68 ATA had no apparent effect on the spontaneous activity of the amphibians, but higher pressures (136 ATA) caused reappearance of spontaneous activity with the animals swimming in normal manner . Therefore, the narcotic effect of the anesthetic seemed to be abolished by an increase in the hydrostatic pressure. The symptoms that appear below 100m are different from those observed in nitrogen narcosis, and they are called High Pressure Nervous Syndrome (HPNS). The occurrence of HPNS was first reported by Bennet during research in connection with nitrogen narcosis during submarine escape from British submarines. This condition includes behavioral symptoms and electrophysiological changes, such as tremors of the hands, myoclonia, increased reflexes, nausea and vomiting, dizziness, fatigue and somnolence (desire to sleep), and dyspnoea. Learn more about inert gas narcosis in part two of this series by Konstantinos Alexiou in our next issue. 1. Balestra, C., Lafère, P., Germonpré, P. Persistence of critical flicker fusion frequency impairment after a 33 mfw SCUBA dive: Evidence of prolonged nitrogen narcosis? Eur J Appl Physiol 112, 4063–4068. 2012. 2. Behnke, A.R., Thompson, R.M., Motley, E.P. The psychologic effects from breathing air at 4 atmospheres pressure. Am J Physiol. 112:554–8. 1935. 3. Bennett PB, Rostain JC. Inert gas narcosis. In: Brubakk A.O. T.S. Neuman (eds). Bennett and Elliott’s physiology and medicine of diving. London: W.B. Saunders Company Ltd. 300-322. 2003. 4. Bennett, P.B., Mitchell, S.J. Nitrogen narcosis, oxygen narcosis and the high pressure nervous syndrome. In Vann, R.D., Mitchell P.J., Denoble P.J., Anthony, T.G., eds. Technical Diving Conference Proceedings. Durham, NC: Divers Alert Network. 2009. 5. Bert, P. La pression barométrique. Recherches de physiologie expérimentale. Paris, G. Masson, 1878. 6. Fahlman, A. PhD thesis: On the physiology of hydrogen diving and its implication for hydrogen biochemical decompression. 1996. 7. Johnson, F.,H., Flagler, E., A. Hydrostatic pressure reversal of narcosis in tadpoles. Science 12:91-92. 1950. 8. Junod, T. Recherches sur les effets physiologiques et therapeutiques de la compression et de rarefaction de l'air, taut sur Ie corps que les membres isoles. Ann Gen Med. 9: 157. 1835. 9. Lindén, A., and A. Muren. Arne Zetterström and the first hydrox dives. FOA Info/Risbergs Tryckeri AB, Uddevalla, Sweden. 1985.